Spring is early here… Very early! People are already suffering from hay fever! My dr says it is ‘because we didn’t really have a winter’ maybe he was down South with us!! We had rain, rain and more rain, but living on a hill was an advantage. It was the lack of proper daylight that got to me this winter. Gorgeous, GM! I’m with you ~ cut flowers fade too fast. But once in a while I enjoy a bouquet of purple daisies. Two days for a bouquet that might cost £40 pounds is ridiculous. Most of the flowers used by florists in Ireland are imported from Amsterdam, thus the cost. I saw tulips on sale the other day and they were either imported or forced. We can pick up bunches of flowers in a supermarket or petrol service station for about £5, My pal in Dublin will get two weeks from them, but I get two days, so I stopped many years ago. My record with houseplants is so poor that I’ve asked Mike to give me cut flowers instead. That spares me the long (or brief) slide of guilt as I over-/under-water the poor thing to death, or watch it succumb to bugs. 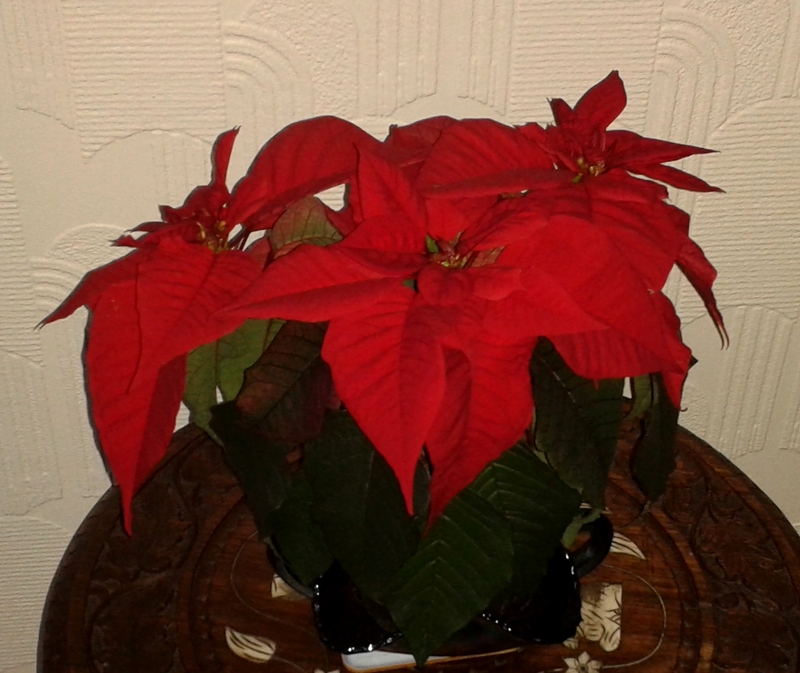 poinsettias are the only plants to survive so far and on three different occasions they have lasted until April. I might be tempted to try an orchid one of these days. I must remember the tip about cactus soil for overwintering rosemary! I think the watering is like taking pills – the same time each day or week for the plants. I do agree about cut flowers. A few days and they’re finished. Pot plants can be enjoyed for months. An orchid for years even! Right now we’re getting a dazzling display of pink camellias in our back garden. Ah Nick, your back garden is sheltered and a whole county to the south of mine, therefore a whole season ahead! I might have a go at an orchid one of these days. Over here spring starts on the Equinox, which is next week. Thus spring will arrive on time here in Virginia. Dianne, in Ireland, Spring has a mind of it’s own. Some years it can be very stubborn. In Taiwan the poinsettias grow in the wild. I always enjoyed seeing them, even during seasons other than winter. Growing in the wild, that would make a great splash of colour. One year my plant had variegated leaves and I loved the colours. I got one to put on the dresser in Mother’s room in Nov., I moved it outside, a week ago, and it is still looking good. Today is officially the first day of Spring, but my skies are acting like a grey colander – leaking rain everywhere! 🙁 No way the poinsettia would survive outside. 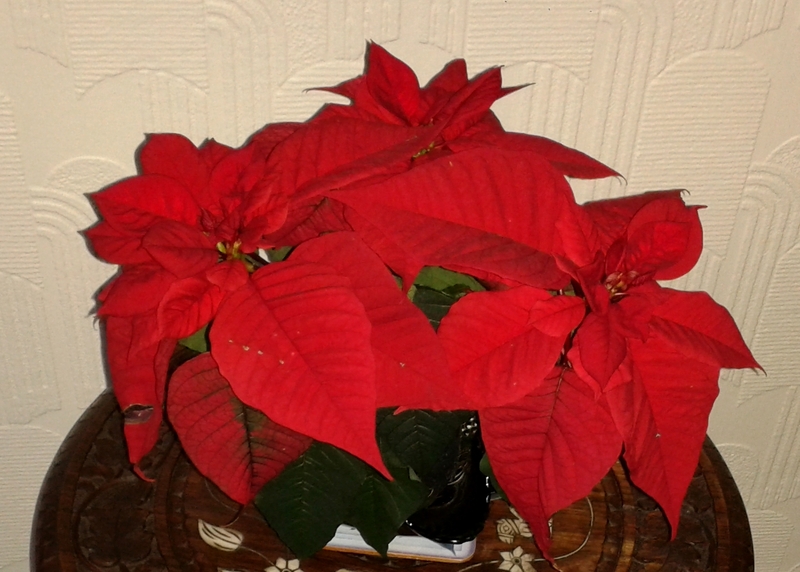 I love poinsettias and they come in various colors. I had a variegated one a few years ago, also long lasting and I loved it. I had a Poinsettia one year that finally had to be put to death in July. It was freaking me out. Betty, at this stage I am curious to see how long it will last.